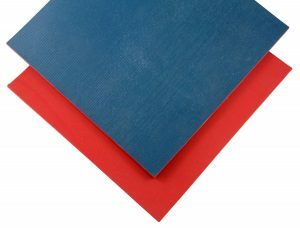 Redco™ NEO CG60 is a heavy-duty commercial grade of polychloroprene is our most popular sheet rubber product. Specially compounded and cured to take advantage of the wide range of benefits chloroprene rubber offers. It offers a balanced set of physical properties including moderate oil resistance, excellent resistance to flex-fatigue and cracking, as well as good temperature, UV and weather aging. Neoprene is also flame retardant and when properly prepared achieves an excellent bond to metals with Redco™ Strongbond adhesives. Advantages: Excellent mechanical properties and good resistance to oils. Uses: Gaskets, impact pads, mechanical parts, seals, etc. This universal weather-stripping is our most popular sponge product. Stocked as full-sheets as well as rolls and tape with PSA adhesive backing. Redco™ CCNEO Sponge is widely used as an economic yet high-quality compressible foam sealing material in an unlimited range of applications. Compounded from a blend of Neoprene, EPDM and other elastomers to provide outstanding flame-resistance, UV/Weatherability and weather-sealing. This popular product is also custom cut and fabricated into complex gaskets and other parts. Available Thicknesses: 1/16” through 2” thick. Tape rolls from 1/4” wide – 6” wide and custom CNC cut into complex parts. Sheet Size: 54” wide standard rolls, tape from 1/4” wide – 6” wide strips and various cut-to-size parts. Limitation: High compression set and limited abrasion and tear resistance. Upgrade to: Redco™ CCNBR Sponge when improved oil contact is required. Uses: Vibration dampening, noise abatement and weatherproofing gaskets & seals. Redco™ NBR-CG60 is a heavy-duty commercial grade of Nitrile blended copolymer, designed with a higher acrylonitrile (ACN) blended content to increase its resistance to oils and fuels. It offers a balanced set of physical properties, including a good resistance chemicals and improved flex-fatigue and compression set. Recommended over our General Purpose nitrile, when a range of minimum properties is required. Limitation: Limited use in extreme cold or elevated temperatures. Uses: Gaskets & seals, anti-vibration equipment parts, etc. Redco™ EPDM-CG60 is a commerical grade rubber and is excellent for general industrial and construction outdoor applications where a good blend of properties is required. Widely used when exposure to UV and Weatherability is a concern. EPDM is a thermo-polymer of Ethylene-Propylene-Diene. Upgrade to: Redco™ P60 Premium. Redco™ IIR-CG60 is high quality synthetic isobutylene-isoprene rubber compound with excellent impermeability and high temperature resistance. Butyl is used in a wide range of industrial applications for its good chemical resistance and often lines tanks, vessels or inflatable rubber articles needing to be a barrier to gas permeability. It is also resistant to alkalis and acids as well as being a good electrical insulator. Advantages: Excellent gas impermeability and weather resistance. Low resilience makes for an excellent vibration isolator. Limitation: Limited abrasion resistance and compression-set. Redco™ CSM-CG60 Hypalon™ is a synthetic rubber renowned for its weatherability, being resistant to adverse environmental conditions coupled with resistance to a wide range of chemicals, acids as well as oils & grease. Used extensively in marine applications, for inflatable boats and waterproofing materials. Advantages: Excellent oxygen and ozone resistance coupled with anti-abrasion resistance. Limitation: There are a wide range of specialty Hypalon compounds. So always check your specification vs. material considered. Uses: Inflatable boat (RIB) components, marine fenders and wear-pads, waterproofing liners and patches. Redco™ CCNBR is an improved grade of closed-cell sponge foam, based on Nitrile (NBR) co-polymer for improved oil and grease resistance. An excellent sealing gasket material for applications where oil contact is an issue. This conformable sponge has closed-cell structure to prevent saturation of fluids and is offered plain or with peel-and-stick adhesive. Advantages: Improved oil resistance over CC Neo sponge. Uses: Seals, gaskets & weather-stripping. Commercial Grade silicone sheeting is designed to be used in applications where physical properties are not critical but extreme temperature resistance and reliable performance are still needed. Silicone rubber has the combined properties of resilience, high temperature stability, and general inertness unavailable in any other elastomer. Silicones are generally unaffected by extended exposure to temperatures from -75º up to +232ºF and are also resistant to aging and degradation from sunlight and ozone. Silicone is a polysiloxane chain. Unlike other rubbers, its molecular matrix does not contain carbon, but consists of silicone and oxygen atoms. It can be formulated to achieve flame resistance, electrical or thermal conductivity, electrostatic dissipative (ESD) as well as FDA and medical compliance. Redco™ Sponge Silicone Rubber (Redco™ CCF Sponge) is also available.